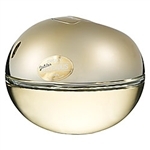 DKNY Golden Delicious glistens with a glamorous burst of succulent orange flower water. The heart beats deeper with floral touches of white rose and muguet flower. In the base, musk, sandalwood, and teakwood blend together, lending a warm, lasting touch of sensuality. And, of course, the scent of Golden Delicious apple provides an elegant and memorable character that shines throughout the life of the scent. Great perfume! I love it! Delivery is very fast. Thank you!